would your mother be proud? are you infringing on someone else’s privacy? 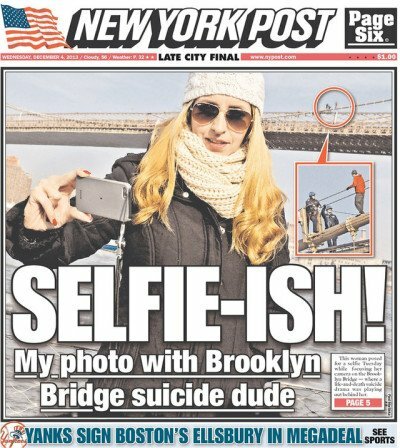 This woman decided it was a good idea to take a selfie while a man in the background was being talked to safety during a suicide attempt on the Brooklyn Bridge. Her behavior landed her on the COVER of the New York Post in early December 2013. Think before you take that picture. *My selfie test is an adaptation of Rotary’s Four Way Test. 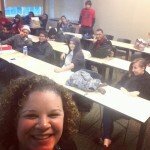 Kerry Rego provides social media consulting, technology training, and speaking. My desire is to alleviate stress, prepare employees, help marketers achieve digital mastery, and educate the public. Want updates on the latest social media news? Sign up by entering email below. GDPR & CAN Spam Act compliant.